Over the years, I've had other moms ask me how my kids became such "good eaters." My sons eat everything from spinach salad with balsamic vinegar, to sushi, to steak and guiness pie. Just like all kids, they have their picky moments, but most of the time, they eat a wide variety of foods and think it's because they never had a choice. Of course, they can choose whether or not they want to eat something, but I would never give them the chance to eat the same thing for days on end. In our house, it's all about variety. I'm always making different entrees and vegetables for dinner. Even if they tell me they don't want to have a certain vegetable or side dish, I put it on their plate so they can try it and most of the time they eat it. They are always getting something different and it's been this way since they've been babies. Last week, I made a steak and guinness pie for the first time ever. It was a special treat for my husband, but I warned him not to set his expectations too high. When we finally sat down to eat, we were in awe! It was incredibly good. 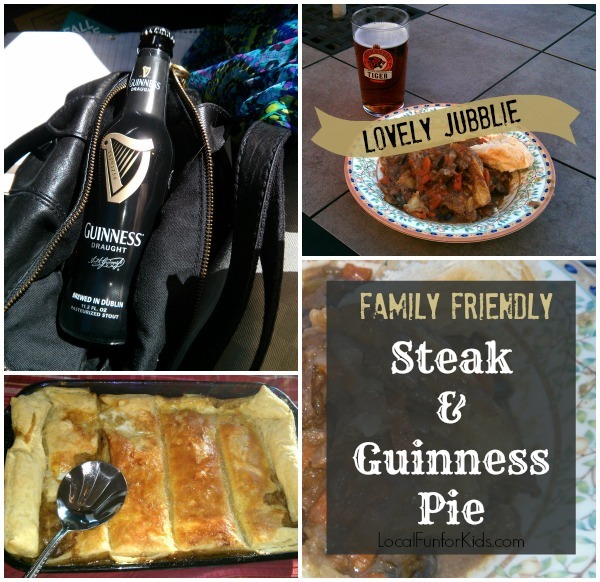 Do you want to know how to make this Steak and Guinness Pie? There's no need for me to reinvent the wheel. I followed Jamie Oliver's Step by Step Instructions and the results were amazing, so I suggest you do the same. I have to admit that cleaning and chopping all of the vegetables took a bit of time, however, everything after that was as easy as pie (pun intended)! My favorite part about the preparation was that all of it could be done early in the afternoon so it eliminated my time in the kitchen after my kids got home from school. So, remember how I told you that I warned my husband this might not be the best dinner ever. I couldn't have been more wrong. He enjoyed it so much that he snapped a photo of his pint and pie for facebook. My kids also loved this meal and I've already been asked when I'm making it again. Fall is officially here, and this was a wonderful recipe to welcome the new season with my family. Do you have any favorite recipes that you make it the autumn?